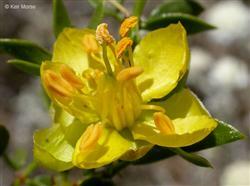 This particular species of shrubs is considered to be one of the oldest plant species. Not only is it ancient but it has beautiful yellow flowers in the spring which give off a beautiful fragrance. This plant does well with minimal water and can tolerate sandy and rocky soil. I love the smell of Creosote Bushes when they're wet. They provide the desert with that fresh aroma when it rains. Creosote Bushes are extremely hardy. They're all over my property in Ocotillo Wells. They can survive years without a significant rain. It also takes a bit of water to get them to green up after being dry so long. They're tolerant to soil being wet for prolonged periods. I say this because they're more prevalent in the lower sandy areas that retain water longer. As the elevation rises and becomes more gravel and rocks they're less frequent and the Ocotillos increase in population.